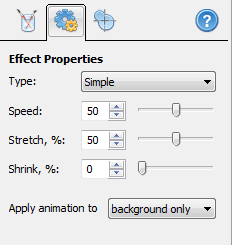 When using the zoom brush, you can set the following parameters. background only - The effect mask covers all underlying animations. whole scene - All underlying animations will be affected, making the effect fully transparent. Activating the last tab allows you to change the position of the central point of the effect.